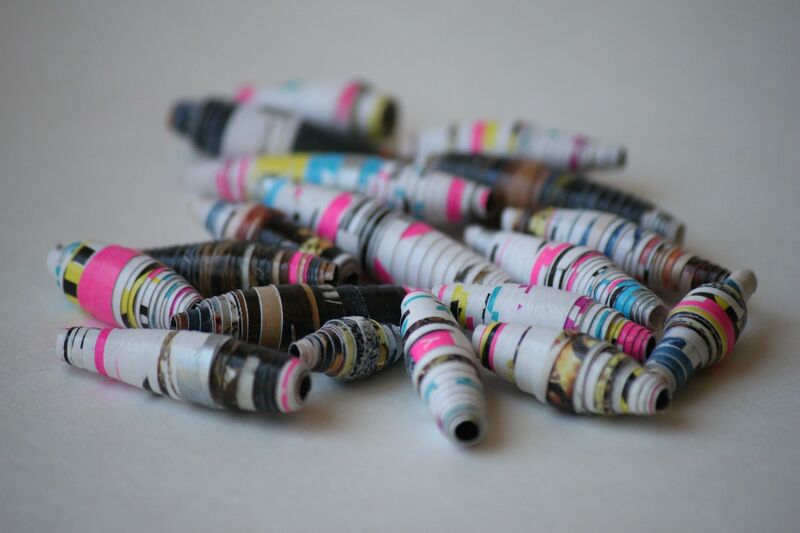 Making your own paper beads is SO easy and you most likely have everything you already need at home. The only thing I had to buy was the Mod Podge. My inspiration for this DIY came after seeing these beads. I knew I wanted to make my own. I did a little googling and came across a ton of how-to sites all with their own little spin on the idea. I found this one to be very helpful. The awesome part about this project is each bead is totally unique and you can use whatever paper you want. 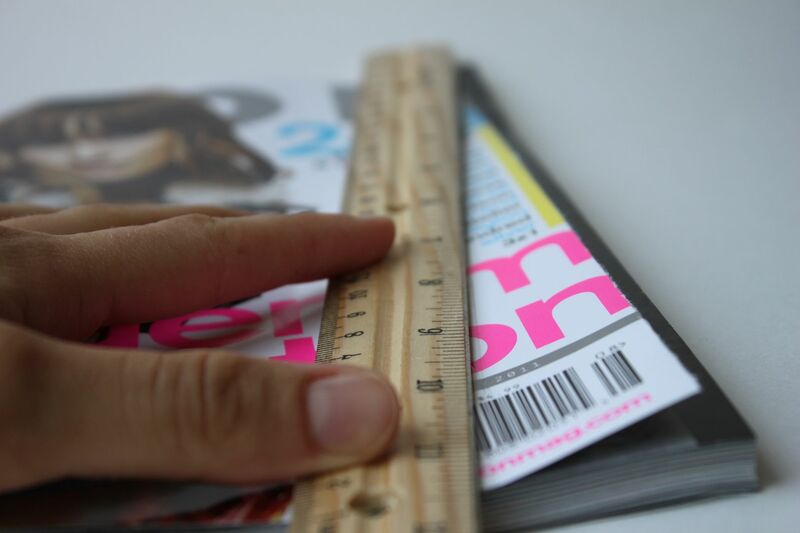 Magazine or another source of paper. 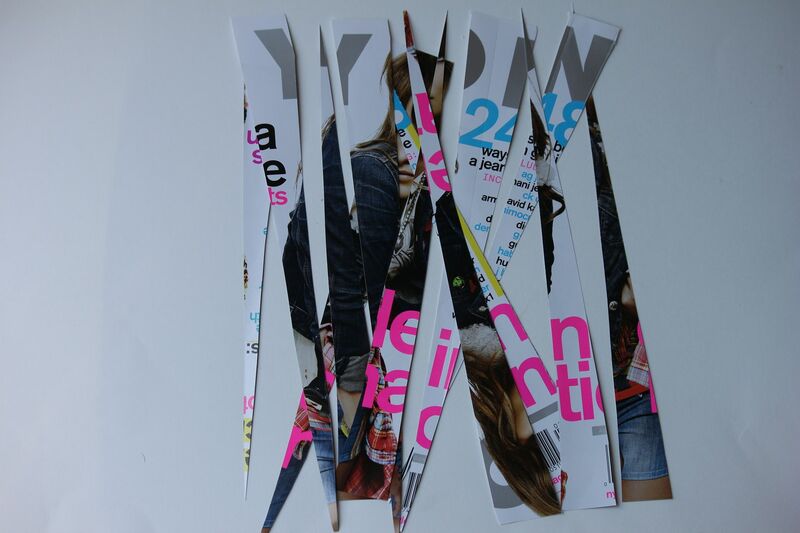 Nylon magazine ROCKS..its full of colorful pages, which is perfect for this project...and its a great read. Using the ruler make long triangles. These will determine how large each bead will be. Mark them with the pencil. Cut out all the different sized triangles. 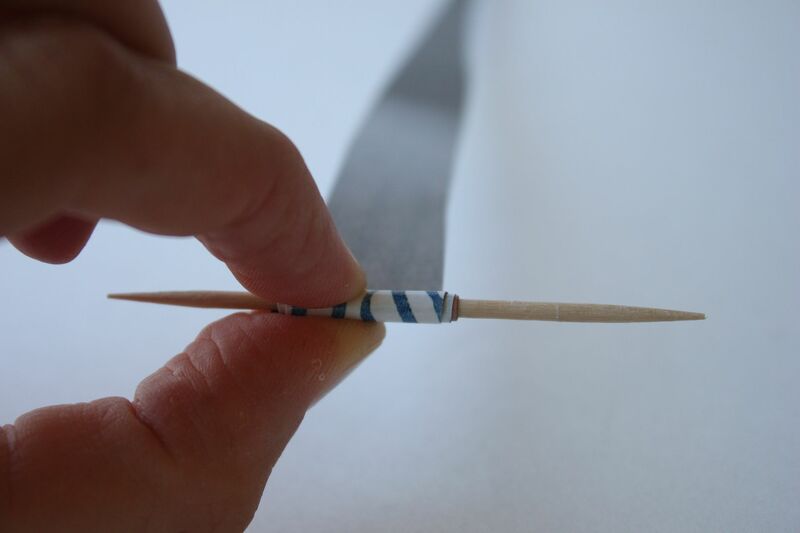 Begin tightly rolling your bead onto the toothpick. Roll starting from the wide side of the triangle. 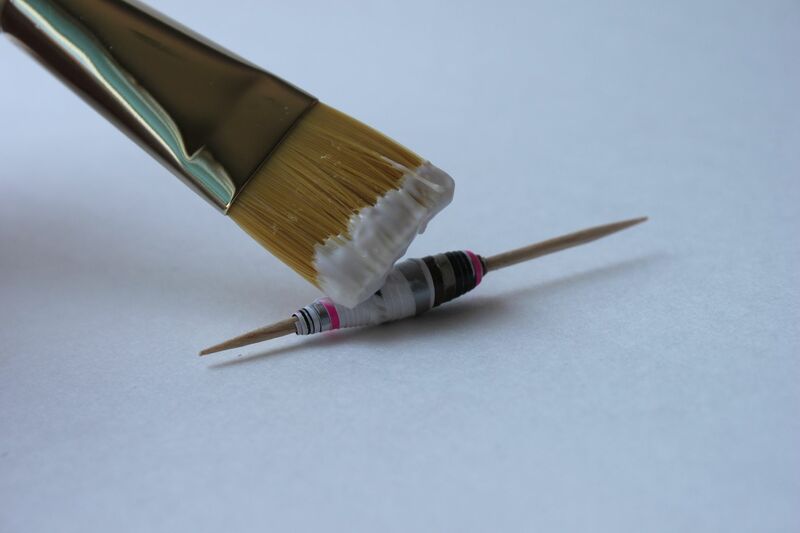 Using the Mod Podge apply a thick coat to seal the bead. 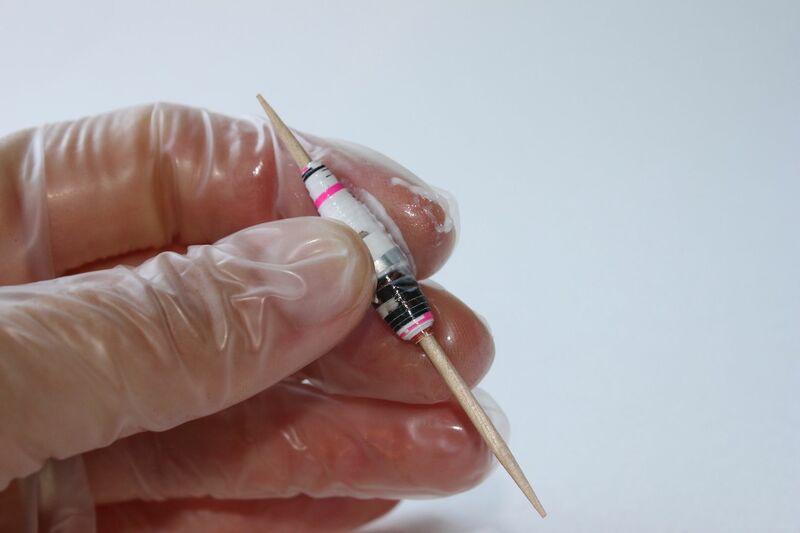 Once you apply the Mod Podge roll the glue around the bead until it is fully coated and sealed. After rolling a few beads without gloves I realized I needed gloves DUH. So add vinyl gloves to your list of things you need. Lay them flat and let them dry. All dried and ready to go! In a few weeks we are going on a little vacation...which entails taking our one year old on a plane. AHHH scary! BUT I have some amazing giveaways coming up while I will be away so stay tuned! Cute!! This is something I can sit down and do with my daughter. I certainly have piles of magazines! That is awesome!! I'm totally telling my friend about this - I immediatley thought of her when I saw it. Happy Friday! You know Lindsay, my little boy made me a paper bead necklace for my birthday this year. It's my most treasured possession. It's a very, very simple version of this one you posted but he did it all by himself at Kindy. It's just so cute when they get old enough and know what they want to give you for a gift. I love the colours he chose too. Blues, golds, aquas, greens. I hope he turns out to be one of these metrosexual types who loves shopping with his Mum and watching old movies. LOL He and I love going to cafes together. Good luck on your vacation. I'm sure you won't have any problems. I was a nervous wreck the first time I flew with my little girl. She was 18 months old. By the time I got where I was going, I had calmed down and it wasn't so bad. You'll have a ball. This is a really unique diy - i love it! perfect for a rainy day! So cool, thanks for the tutorial!! I love unique pieces like this :) What are you going to do with the beads now? I can't wait to see!! Those are SO COOL! Me likey a lot. I may have shed a tear when I saw I didn't win the bracelet. I'm going to have to go visit it on my Pinterest board to make myself feel better. I most definitely am doing this!! Such a good idea! very cool! I've never seen a DIY like that before! Can't wait to try. thank you for the comment on my blog! I love these beads and have everything to make them at home.... i think I may need to get crafty this weekend!! I'll let you know how they turn out! good luck with the plane ride! Congrats to Sara and I love those beads! You are so creative! Wish we lived closer. Awesome! I've always wondered how these were made..so simple! I am blown away. Those paper beads are so awesome! Wow, Lindsay, these are great!!!!!!! Congrats to the winner of the giveaway! Thanks for swinging by my blog and wishing my g'ma well. This project is awesome, I cannot wait try it myself when I get back next week. Have a wonderful weekend! I love making paper beads! Love this! Great colors! Thanks for sharing! what a fun idea and a great project for me to do with my sister when I see her at the end of the month! you make them look all so perfect. when i try they look a little lumpy. You just keep rolling out awesome DIY's, don't ya Ms. Crafty?! This looks really cool. Thanks for sharing. p.s. What did or are you going to use them for? A necklace, bracelet? I had no clue making these was so easy! Thanks for sharing a fun DIY :) Hope you're having a great weekend! p.s. Sometimes when I'm typing out DIY in my head I'm saying DUI. What is wrong with me?!?! this looks like an awesome craft. trying it for sure! love this! 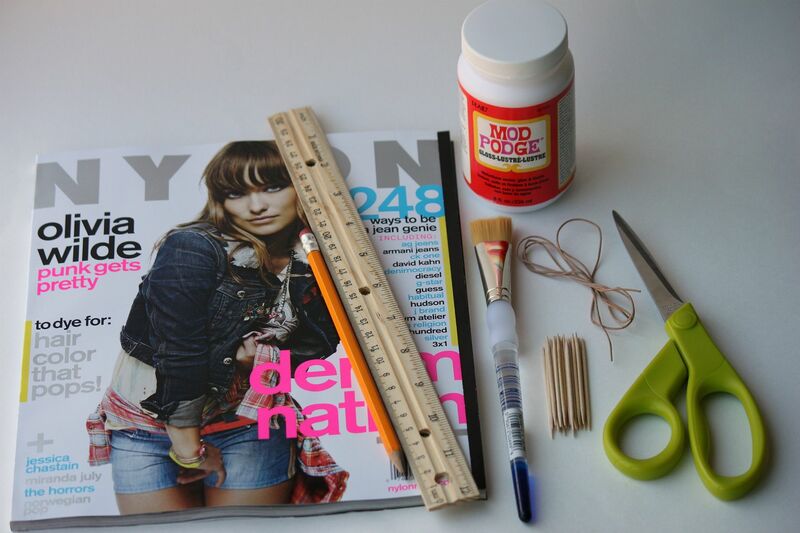 Such a great way to use up all the old magazines! you're always so creative, love your simple crafty projects, lovely as usual! Great DIY - thanks for sharing! If anyone would rather not get their fingers messy, I will happily do custom bead orders with any type of papers you want! I love working with unique vintage papers and prefer to reuse materials as opposed to buying new!